September and onward are my months for eyeliner! Gone are the days of my makeup melting and I’m back to work every day which means I have to get done up right so I don’t scare the children. When MAC Cosmetics left the animal-friendly realm many years ago, I was devastated. What could POSSIBLY replace my Eye Kohl? Or my cheap eyeliners from the drugstore? I tried many cruelty free eyeliners only to have them irritate my eyes, not stay on long enough, or just not be worth it price-wise! But, with some patience I’ve rounded up just the ones for you! Smile ladies (and gents), your eyes are the window to your soul, right? Do them up nice! BWC is one of my favorite brands for cruelty free mineral-based makeup. I love that their products are natural and that they work! Carbon Black by BWC gives you a mid-range oomph factor, so this shade is perfect for your office, but can easily be layered and/or smudged for a smokier look. In terms of removal, I love their eye makeup remover which is gentle and effective, but even gentle soap and water will have you fresh-faced in no time. Fior Minerals is a true luxury brand! This eyeliner in Black Betty almost borders on a gel/pencil hybrid and offers some serious va-va-voom in terms of the shade. After years of searching, this one comes closest to my formerly beloved MAC Eye Kohl. Like BWC, Fior is organic and all natural! There is no dragging, itching, or discomfort with this eyeliner. Bonus? Fior also specializes in gluten free makeup options for those who need it! Oh, Pacifica! How I love thee! Natural, vegan, and woman owned = everything I love! But, unlike some of the other brands I’ve featured, Pacifica offers a more wallet friendly option for your vegan eyes! Pacifica’s eyeliner also goes on smooth, though the Jet color is more like a very dark grey (at least on my skin). Inside are jojoba oil, shea butter, and Vitamin E to help pamper the delicate skin along your eyes. This replaced my go-to drugstore CoverGirl brand within a flash. Pacifica’s formula is also long-lasting, so there’s no need to touch up before you head out for the night. Going for the ultimate in budget friendly? Look no further than NYX and their Collection Noir. I’m a big fan of their Satin Finish Eyeliner which is between a pencil and gel. It’s smooth, offers more drama than some of the more expensive options listed here, and is also available as a liquid! My only tip? Use a good eye makeup remover (BWC and Pacifica make great ones), so you don’t have raccoon eyes in the morning! The last, but not least on my list is from Pür, a high-end luxury mineral brand that I’ve had the opportunity to try. Double Ego Eyeliners offers two looks in one which is innovative and convenient. For those of you who love a good brown liner shade, here it is! I liked how this shade was subtle but easily amped up with the liquid end of the pencil. Pur offers a pencil and liquid in one to form an awesome look. My only gripe was the liquid liner tended to run and took a while to dry and set up. If you have time, and want to go luxe, this might be the one for you! Overall, I have not looked back when it came to switching my lifestyle to animal friendly. Quality is hands down on par with the “big box” brands and often, in my opinion exceeds it. CF to me, means higher quality ingredients and an all around safer product to use on my skin. 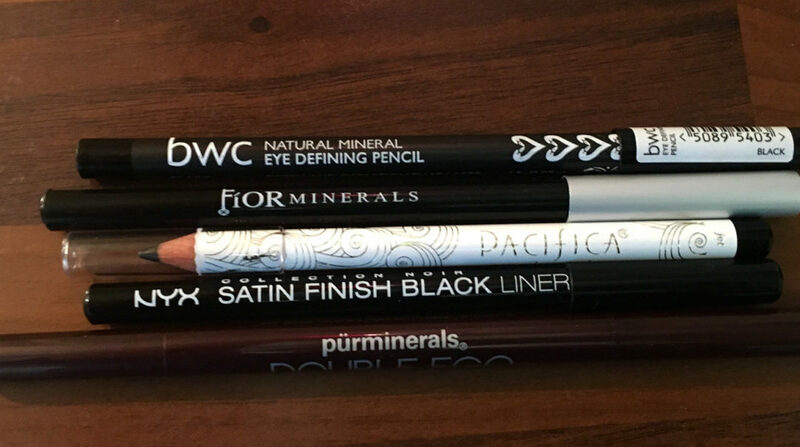 So, if you’re not sure you’re ready to make a complete switch, try one of these great liners and let me know what you think! Author’s note: The items mentioned in this post were provided by a representative of the company. No compensation was provided and all opinions are that of the author’s.